Starring: Auli’i Cravalho, Dwayne Johnson, Rachel House, and more. Disney cooks up their patented animated formula to bring the entertainment world their newest film, “Moana”. Whether it is Oberrated approved or not, well, you will just have to keep reading on. Until then, there are high expectations that naturally come when viewing a Disney film and the critics have surely supported those high expectations. Critics are raving about the film saying praise like “Contemporary Disney at its finest.” and, “Moana is keeping the tradition of Disney movies alive”. With such a strong start and high praise, how will “Moana” fare on the Oberrated scale? 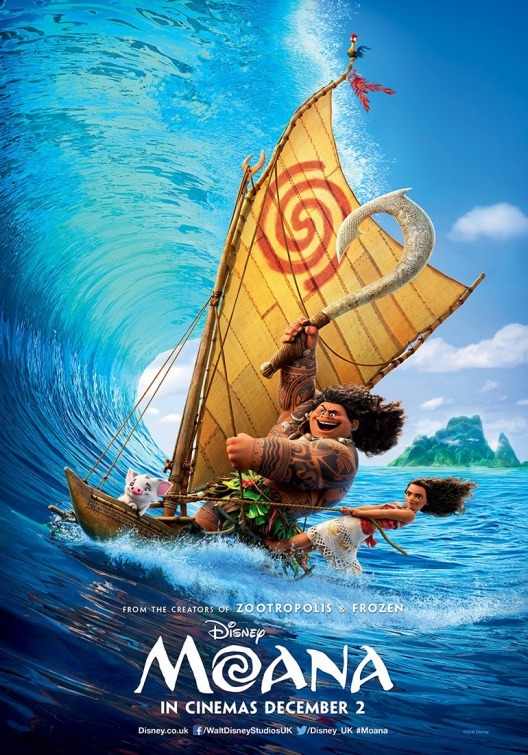 When what is nothing less than perfect island life is threatened by a curse caused by the demigod Maui (Dwayne Johnson), a chieftain’s daughter, Moana (Auli’i Cravalho) is chosen to correct what has gone wrong by seeking Maui himself and embarking on an adventure to fix what he has done. “Moana” was as fun and light-hearted as I could have wanted. A truly entertaining piece brought to us by Disney but who could have honestly expected anything different? Before getting into anything else, I have to first bring focus to how beautiful this movie is. The animation is so perfect and wonderfully done that I had moments where I forgot I was watching an animated film. From the models themselves, to the water effects, to the simplest motions. This was a truly beautiful movie to witness… “Moana” also was very fluid and entertaining from start to finish. I never sat bored or felt rushed, it was a smooth and easy film to follow. Entertaining for the youngest of watchers to the most seasoned movie goer… Lastly, what is a Disney follow up movie to “Frozen” without a little music? The singing pieces within this film was also a bunch of fun to experience. Although I can see other viewers getting annoyed or tired of the music but you come to expect that going into a Disney movie like “Moana”. I personally enjoyed Dwayne’s song “You’re Welcome” but of course, I am a bit biased when it comes to anything Dwayne. There is not much else I can say beyond what is already said. It is another animated Disney movie, but a brilliantly done one at that. “Moana” is a film for all to love and is well deserving of all the kinds of praise it has been getting in recent weeks. Keep an eye out for this one in the future as well for the coming Oscars season. Posted in 2016 Movies, Disney, Movie Review, Oberrated Requests, Uncategorized.